with Isabelle Cantat (IPR), Matthieu Roché (MSC Paris), I. Griffiths (Oxford) and Howard A. Stone (Princeton University). how far soluble surfactants spread on water ? and how the amphiphilicity sets the Marangoni hydrodynamics ? Phys.Rev. Lett., 112, 208302 (2014). And go to this page to find articles in the press about this work, and a nice movie on the INP website. 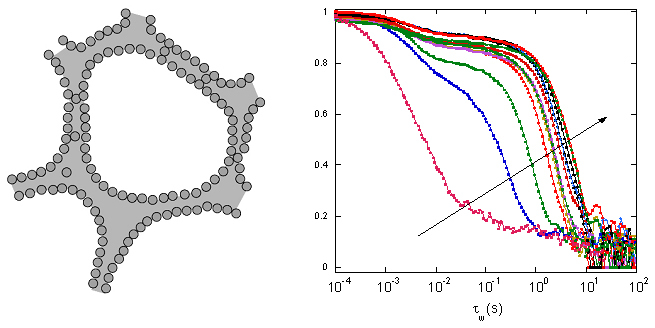 Investigating the links between microscopic structures and macroscopic dynamics: tubular or micellar mesoscopic organisation of fatty acids in bulk control both the macroscopic bulk and interfacial rheology. Moreover, the non-trivial thermoresponsivity of the molecular system provide original and widely temperature-tunable bulk and interfacial viscoelasticity. Soft Matter, 2014, 10 (20), 3622 - 3632. Highly viscous fluids, like honey, make coils when falling on a solid board... elastic ropes also make coils... what about the coiling of a viscoelastic fluid? We investigate the coiling of aqueous foam column, and study how it depends on the foam intrinsic properties (liquid fraction, bubble size, chemical formulation) as well as on the foam column diameter and its falling height. In collaboration with V. Leroy at MSC - Paris. Here, we investigated the velocity and the adsorption of various ultrasonic signals (40kHz) propagating through controlled foams. 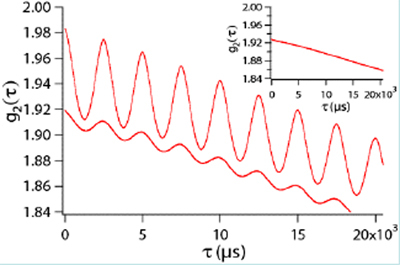 Surprinsingly, all our results evidence the existence of a resonance effect. Foams have very unusual acoustic properties. 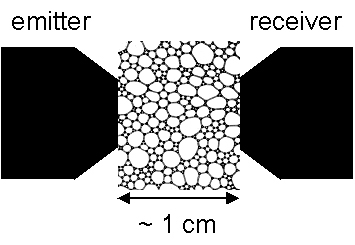 The propagation of sound inside a foam remains poorly understood. 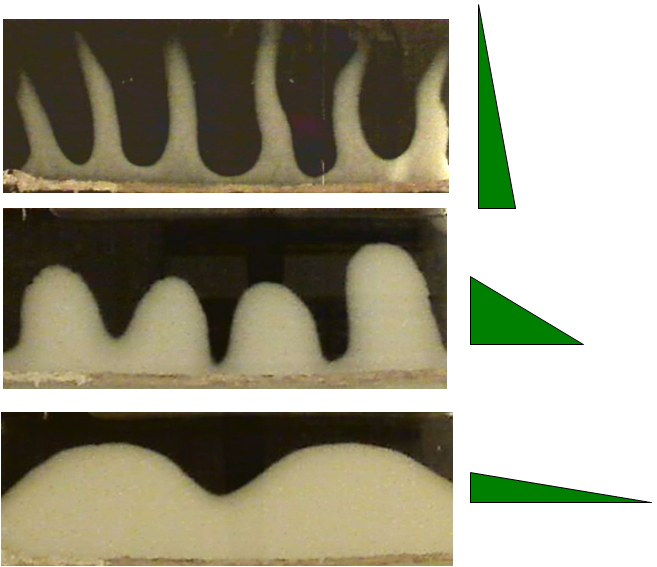 We first studied "dancing foams" : we measured the displacement induced by acoustic inside a foam, by using an optical technique (diffusing wave spectroscopy). 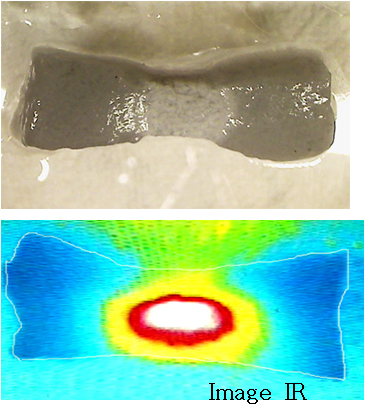 We also developped a new approach to monitor the features of an acoustic wave propagating into a foam. 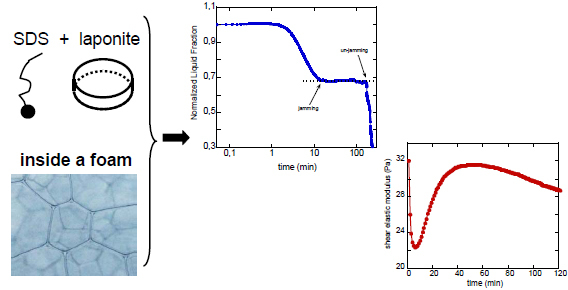 "Synchronized Diffusive Wave Spectroscopy: Principle and Application to Sound Propagation in Aqueous Foams"
In collaboration with F. Gaucheron at STLO-INRA Rennes. 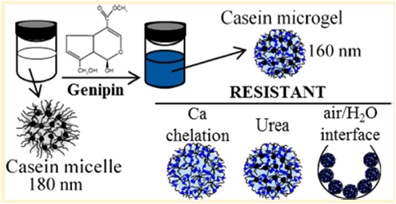 By adding Genipin to solutions of casein micelles, we were able to create a new colloidal object, and studied its resistance to destabilizing effects. In collaboration with M. Monloubou, I. Cantat and B. Dollet at IPR. 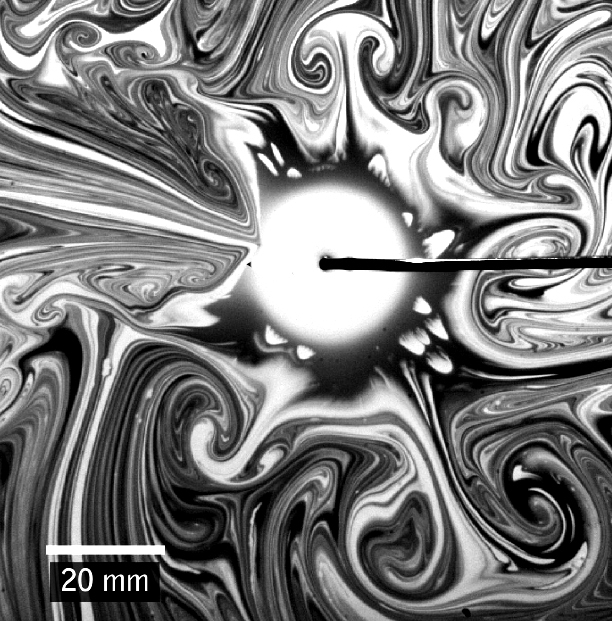 blast wave absorption by liquid foams is especially efficient, and bubble size or liquid fraction optimization is an important challenge in this context. "Influence of bubble size and thermal dissipation on compressive wave attenuation in liquid foams", EPL, 112 (2015) 34001. In collaboration with Anne-Laure Fameau (INRA Rennes) and O. Velev (Norht Caroline State Univ.). 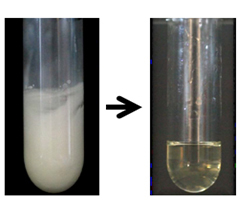 we introduced a novel approach to produce oil foams made from an oleogel based on fatty alcohol platelets dispersed in sunflower oil. 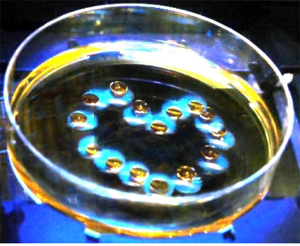 The produced foams are stable for months, while the collapse of the foams could be induced quickly upon heating due to the melting of the crystal particles surrounding the bubbles. 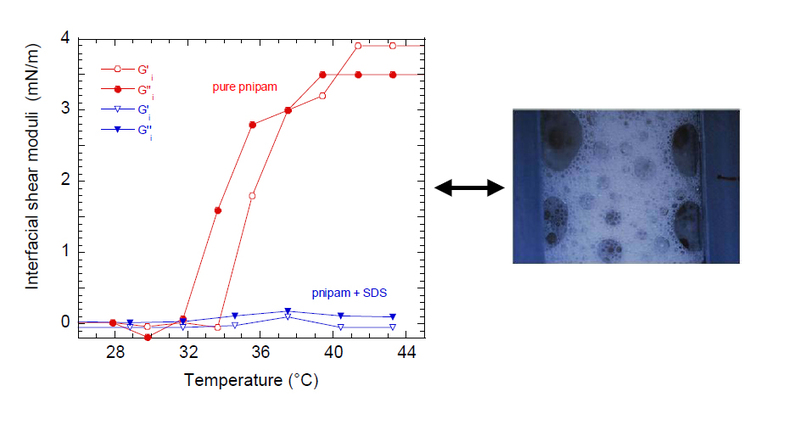 Using solution of Poly-nipam in 2D cells, we investigate thermoconvective instabilities, ...but with a polymeric solution which properties change drastically at a well-defined temperature. In collaboration with E. Chevallier, F. Lequeux and C. Monteux, ESPCI, Paris ; and I. Cantat, Rennes. 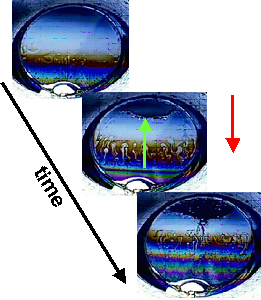 Using photoresponsive surfactants, we are able to trigger flows, by a UV illumination, opposing the usual gravitational drainage: in a vertical thin liquid film, the fluid can refill the film (green arrow) once under UV. 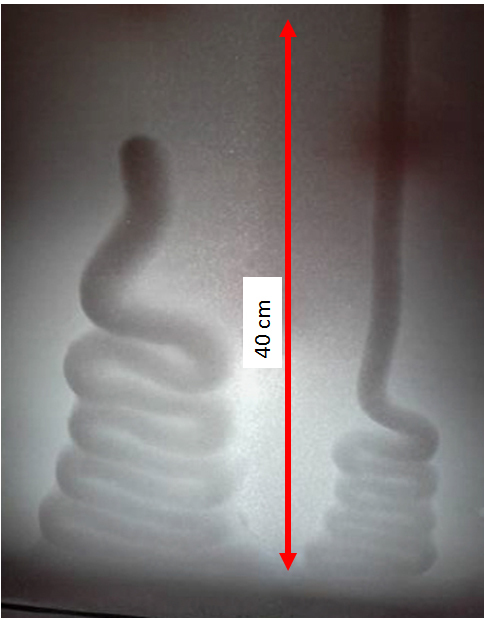 Similar light-induced pumping effects occur alo in 3D foams, at the scale of the liquid channels (Plateau borders). In collaboration with G. Maurdev (CSIRO, Australia), and F. Gauffre (ISCR). 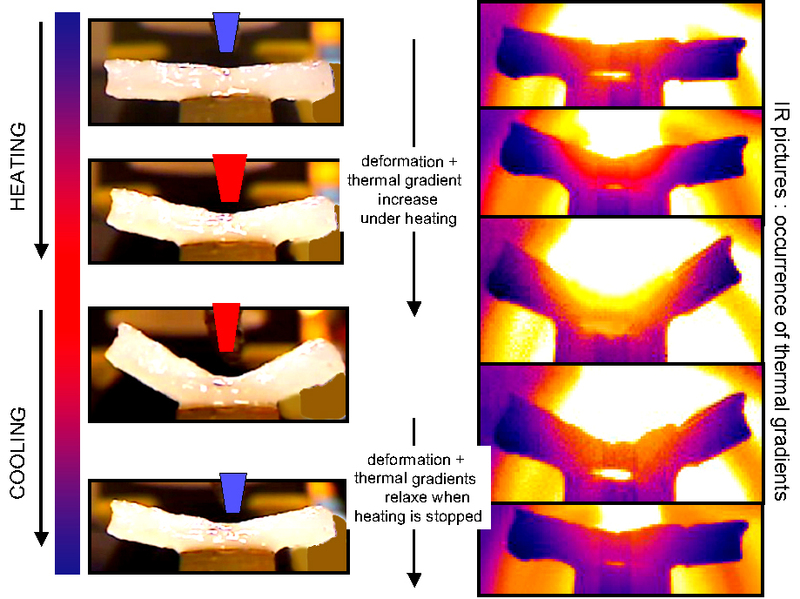 large and reversible deformations of soft thermoresponsive gels (based on Poly-nipam) can be induced by temperature-induced local swelling or shrinking. Some people suggested that these bending gels look like "living sushis". Want some :) ? 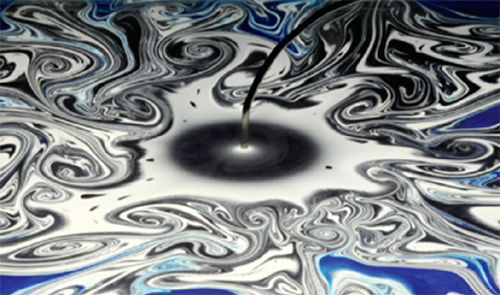 How an oil droplet, sitting on top of a liquid pool, can be moved only by light ? And how the direction of the displacement can depend on the wavelength of the light ?? Angewandte Chemie Int. Ed. , 48 (49), 9281 (2009). And go to this page to find articles in the press about this work. Anne-Laure Fameau, Arnaud Saint-Jalmes, Fabrice Cousin, Bérénice Houinsou Houssou, Bruno Novales, Laurence Navailles, Janine Emile, Frédéric Nallet, Cédric Gaillard, François Boué, Jean-Paul Douliez. 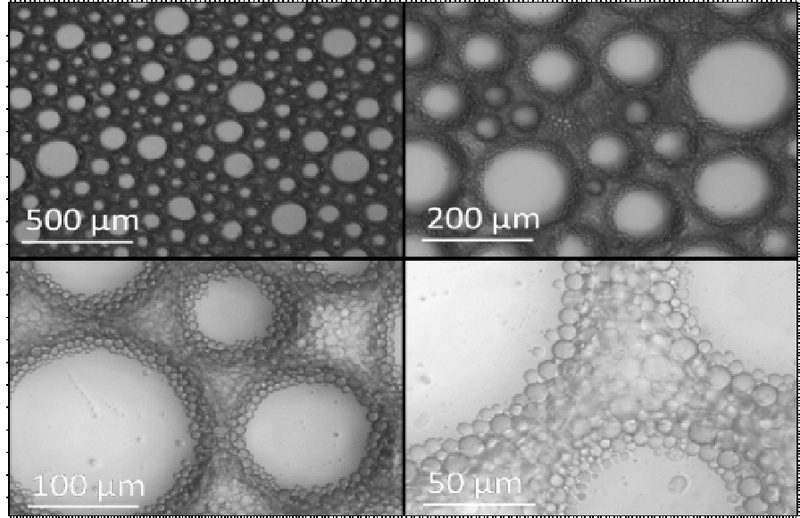 A previous study - published in Soft matter in 2008 (see the "papers" section) dealt with the outstanding stability of these foams, containing no surfactants, but solely stabilized by silica nanoparticles. "Two-Modes Dynamics in Dispersed Systems : the Case of Particle-Stabilized foams Studied by Diffusing Wave Spectroscopy." A. Stocco, J. Crassous, A. Salonen., A. Saint-Jalmes, D. Langevin. Physical Chemistry Chemical Physics (2010). Here comes a second paper on these issues : “probing the dynamics of particles in an aging dispersion with diffusing wave spectroscopy” J. Crassous, A. Saint-Jalmes, Soft Matter, 8, 3683 (2012). what do you get when foaming an emulsion ? 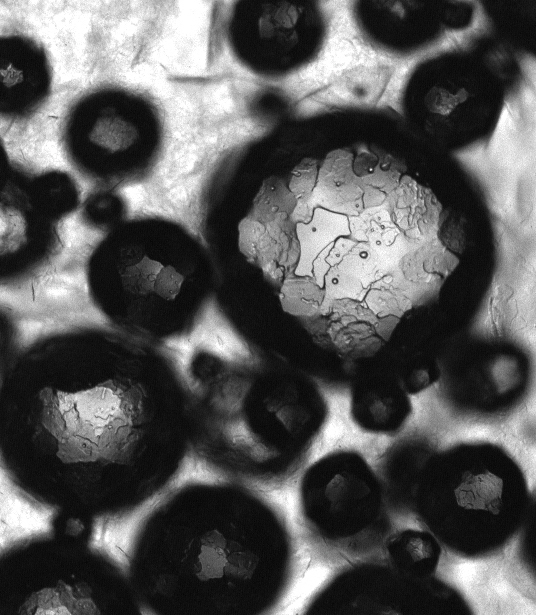 bubbles and droplets have to co-exist, and possibly make "foamulsions". And it can go from rapidly collapsing foamulsions to ultra-stable ones. 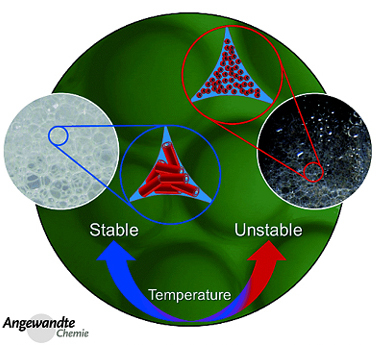 “Surfactant Foams Doped with Laponite : Unusual Behaviors Induced by Aging and Confinement” R.M. 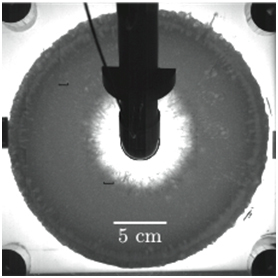 Guillermic, A. Salonen, J. Emile, A. Saint-Jalmes Soft Matter, DOI: 10.1039/b914923f (2009). 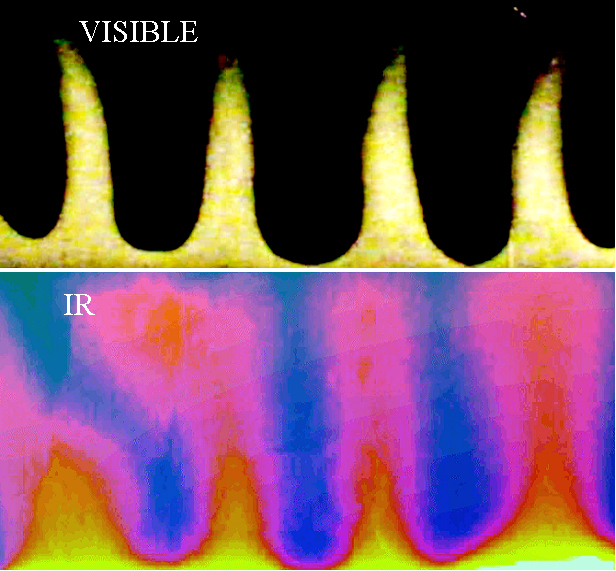 we recently investigated the interfacial dynamics of interfaces where a thermoresponsive polymer (Poly-NIPAM) is adsorbed. It turns out that the whole viscoelasticity - both in shear and in compression - can be widely tuned by the temperature, within a short range of degrees. Associating these interfaces, can we get responsive foams ? and what is the impact of the addition of a surfactant ? These are some of the issues we have investigated. 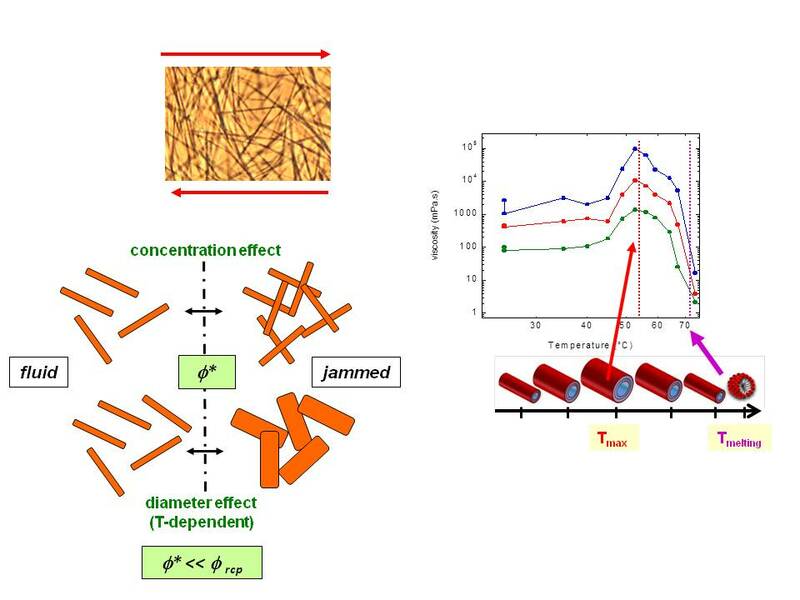 “Dynamics of poly-nipam chains in competition with surfactants at liquid interfaces: from thermoresponsive interfacial rheology to foams”, R.M. Guillermic, A. Saint-Jalmes, Soft Matter, 2013, 9, 1344. It's amazing how an interface can enhance and reveal tiny tiny biochemical modifications ! Yann Desfougères, Arnaud Saint-Jalmes, Anniina Salonen, Véronique Vié, Sylvie Beaufils, Stéphane Pezennec, Bernard Desbat, Valérie Lechevalier, and Françoise Nau.